Preheat the oven to 425°. Put a large 12-cup muffin pan in the oven to heat. In a medium bowl, combine the milk with the flour, eggs, salt and 1 tablespoon of the beef fat. Using a handheld electric mixer, beat until very smooth. Remove the hot muffin pan from the oven and add 1/2 teaspoon of the beef fat to each cup. Return the muffin pan to the oven and heat until the fat is very hot, about 5 minutes. 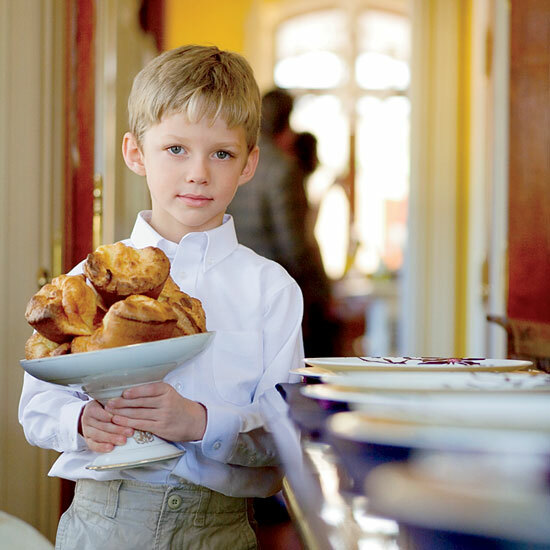 Carefully and quickly pour the popover batter into the muffin cups and bake for 20 minutes; don't open the oven door. Reduce the heat to 350° and bake for about 20 minutes, until the popovers are golden brown and puffed. Serve right away.